Spaghetti with kale, garlic and parmesan. This recipe comes from Duchy Home Farm in the Cotswolds, and serves 3. Cut the kale into ribbons/strips. Bring a large pan of salted water to the the boil, add the kale abd cook for two minutes once it has returned to the boil. Remove the kale with a slotted spoon and refresh unser cold water. Put the spaghetti into the boiling water and cook according to the packet instructions. Chop the red onion and garlic finely. In a separate pan melt the butter and oil, add the onion and garlic, a pinch of salt and some ground black pepper. Gently cook it until the onion is translucent (not burnt!). Add the kale to the garlicky mixture and mix to coat the leaves well. Add the cooked and drained spaghetti and mix well. Serve on warmed plates with freshly grated parmesan sprinkled over. 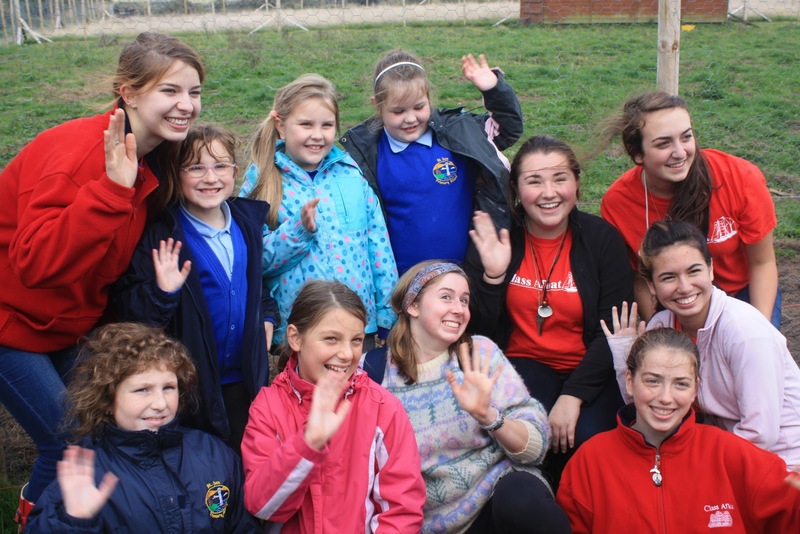 Many thanks to Francesca, who volunteered as a wwoofer on the farm for one week, and especially thanks for leaving half a chocolate cake behind for us! It's that time of the year when your tomatoes stop ripening and sit there looking green and unappetising. So here's an easy recipe to make delicious green tomato chutney! 1 teaspoon chilli powder (or a fresh chilli or two). Put everything into a pan, bring to the boil, reduce the heat and simmer for one hour until thick, then spoon into sterilised jars. You can start eating it next day, or store it in a cool place. 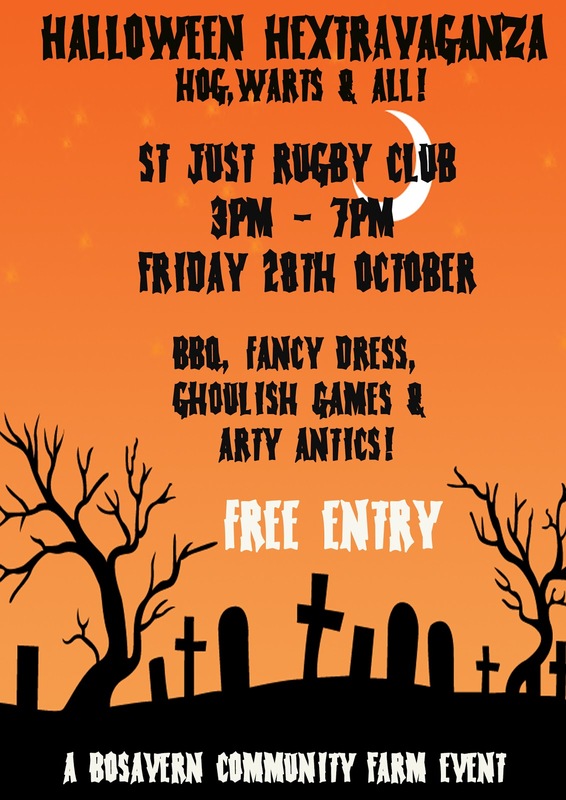 For our next event we are teaming up with St. Just Rugby Club on Friday 28th October, 3-7pm, to present a "Halloween Hextravaganza". 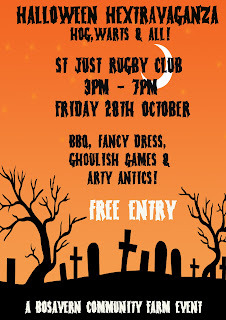 There will be arts and crafts, games, fancy dress, and a barbecue using pork reared on the community farm. Everybody welcome! Here's a delicious recipe we found on the internet. It makes 3 small jars of chutney/relish, great with fried eggs or whatever really. We have three varieties of hot chilli available at the farm gate stall - "ring of fire" red chillies, jalapeno peppers, and "amarillo" fat yellow chillies. Finely chop chillies, including seeds. Finely chop onion and garlic. Mix together chillies, onion, garlic, cumin, turmeric, ginger, salt and oil. Put in a heavy-based pan and fry for 15 minutes stirring often. Add sugar and vinegar, bring to boil, cover pan and boil for 10 minutes stirring occasionally. Spoon into sterilised jars and seal immediately. First day on the new polytunnel. 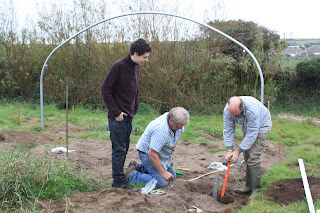 Yesterday we held a special volunteering session to get as much of our new polytunnel built as possible, so many thanks to the 12 people who came along throughout the day to help. Simon and Hugh began on the Friday by marking out the site of the tunnel, using a laser theodolite to level and measure the site to within an inch (the new tunnel is 66 by 16ft, so we're working in imperial measurements). 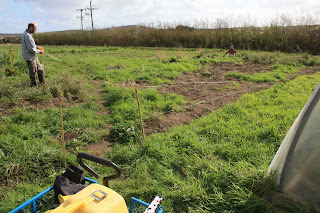 Simon marking out the site for our new polytunnel. Which meant that when people arrived on Saturday morning we already knew where the 26 2ft-deep holes had to be dug and it was all hands on spades. 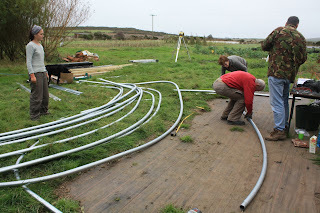 By the end of the day we had all the holes dug, most of the anchor-plates and base-poles in place, half of the hoops erected, and 2 strengthening struts attached. Putting the hoops together, with Alice, Nigel, Jean and Kent. Getting those anchor-plates just right, with John, Bob and Simon. Putting the community into farm - a well-deserved and delicious lunch in the farmhouse kitchen. We will be continuing the work on Tuesday afternoon, 1-5pm (our usual volunteering session) so if you want to lend a hand please come along. Soil Association National Horticultural Symposium. 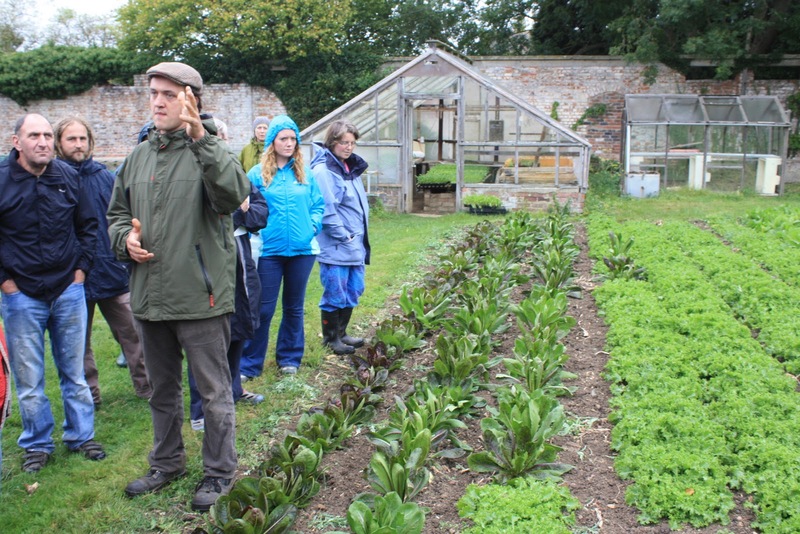 As Bosavern Community Farm is a producer-member of the Soil Association (www.soilassociation.org), the UK's leading organic certification body, Hugh attended their symposium for two days in Bristol last week. It was good to put faces to names, get new ideas, hear the latest news, but most of all to meet all those other people scraping a living from growing organic vegetables around the country and realise that we're not alone! 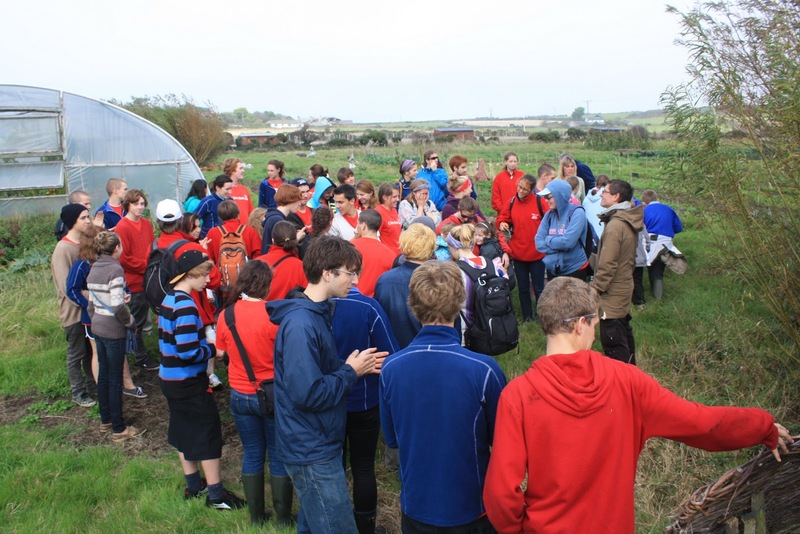 On the first day there were talks and presentations, plus heated debates, about topics such as growing green manures in polytunnels, the state of the current UK market for organics, school meals, and open-pollinated seed varieties (i.e. non-hybrids). On the second day we visited four farms in the Cotswolds area north of Bristol, to see for ourselves how other farms do things, and get their stories straight from the horses' mouths. These are particularly useful, as you can learn from other people's mistakes, and maybe even offer solutions of your own experiences. 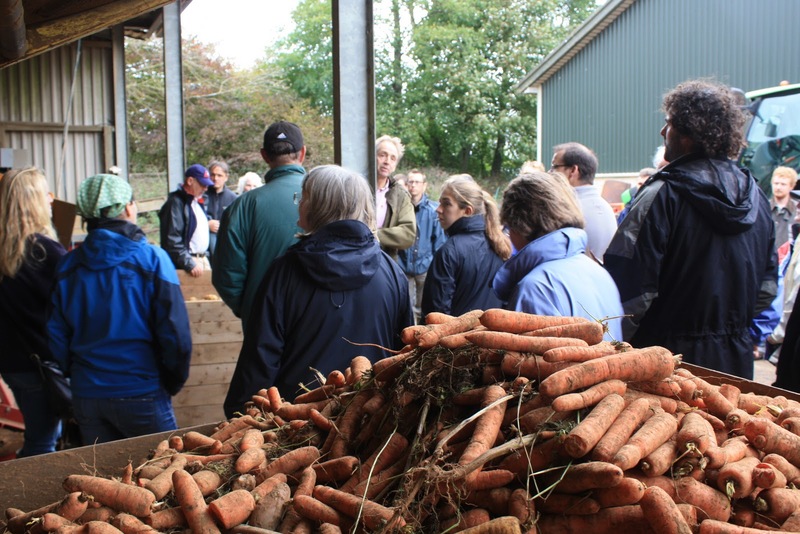 Tales of organic carrots and excessive supermarket controls at Duchy Home Farm. 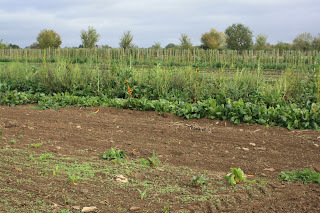 The veg field at the second Duchy farm. 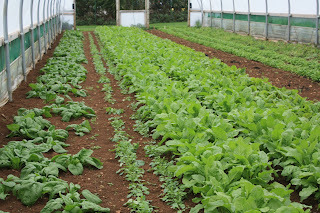 Salad crops in a polytunnel at Abbey Home Farm. The walled garden at Stroud CSA. The most pertinent of these visits to our own situation was Stroud Community Supported Agriculture, who grow biodynamically on a mixed farm, and supply 190 "shares" per week to their members - see their website at http://www.stroudcommunityagriculture.org. Many thanks to staff at the Soil Association for organising such a good 2-day event, and to all the growers whose nuggets of wisdom made the symposium even more worthwhile attending (even if it was just crying into each other's pints about that root of all evil - couch grass!). 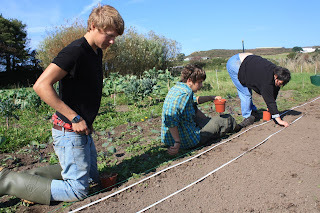 Many thanks to Robert and Milan, two young Germans who came to wwoof on the farm for a week. Anybody who enjoys digging up potatoes by hand is welcome! Good luck with the rest of your travels, and thanks for all your hard work. Planting onions and garlic - full circle. On 7th October 2010 we planted onion and garlic sets in the first bed to be prepared on the outside vegetable strips. 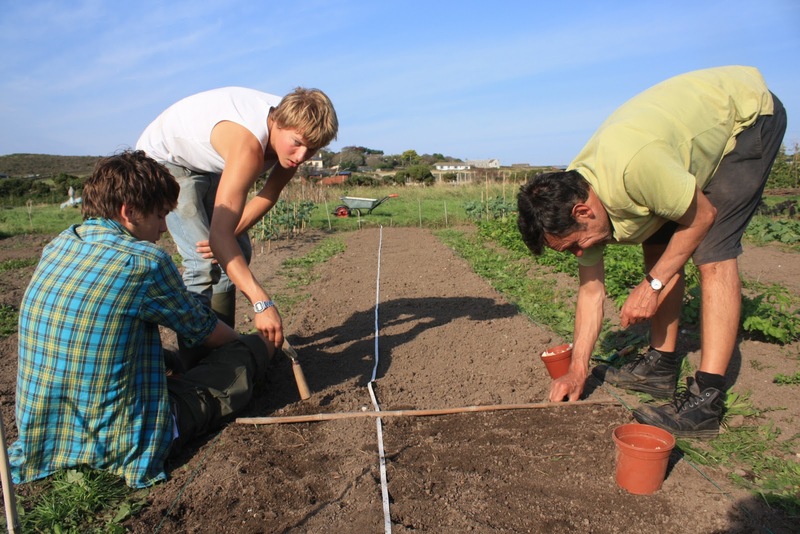 This year, on the 29th and 30th September and 1st October, we completed the circle and our first full growing year on the farm by planting onions and garlic in three outside beds. All being well, there will be five times the amount of onions and garlic to be harvested in 2012 as there were in 2011. This year we have continued with "radar" onion sets because they performed so well over last winter (easily outperforming the spring-planted "sturon" and "red baron" sets for size and yield), but have switched from "flavor" to "vallelado" garlic due to availability of the sets. Milan, Robert and Anne planting onion sets. 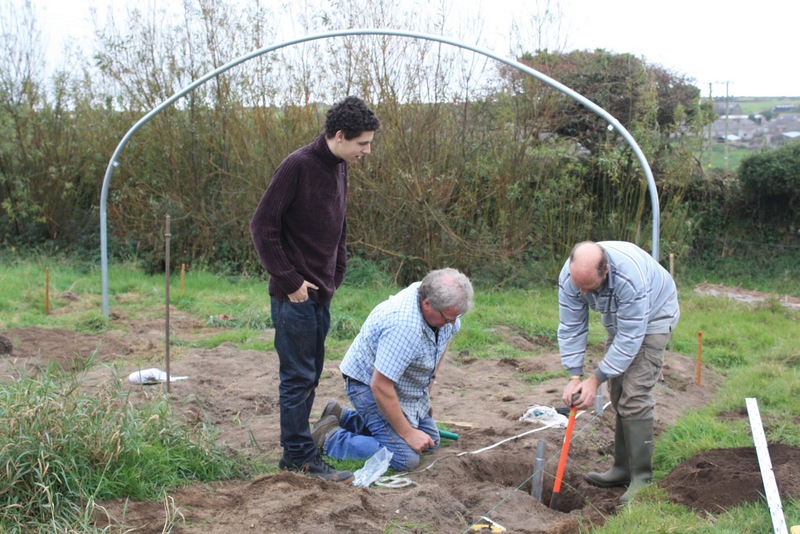 Robert, Milan and Jim planting garlic sets. year 4 = allium (the onion family) with carrots and parsnips also included. This crop rotation system, and variations of it, is organic farming's main tool for the reduction of crop pests and diseases. 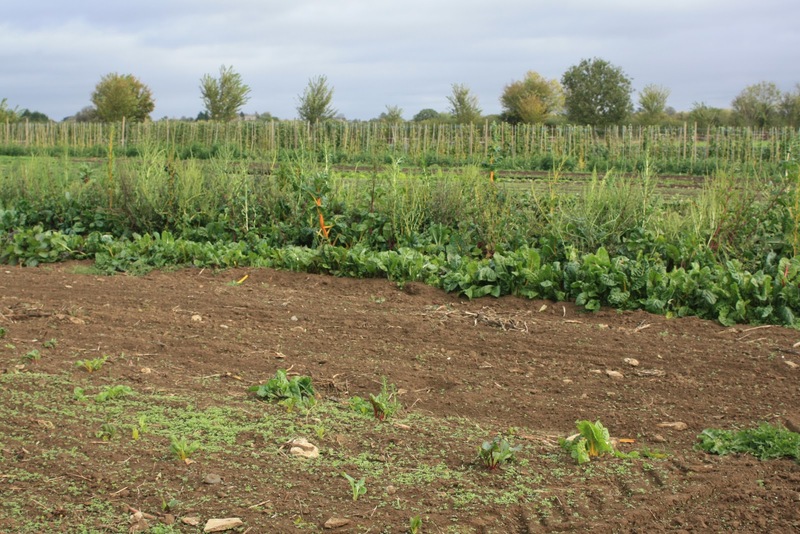 Each crop family is moved on year after year, so that their specific problems do not build up in the soil, which would happen if the same crops are grown in the same soil continuously. On Tuesday 27th September, Bosavern Community Farm was visited by "Class Afloat" as part of their tour of Transition Penwith projects in the area. "Class Afloat seeks to provide, for each of its students and faculty, unparalleled learning experiences in incomparable settings aboard a tall ship and around the globe" - see their website www.classafloat.com - for more information. 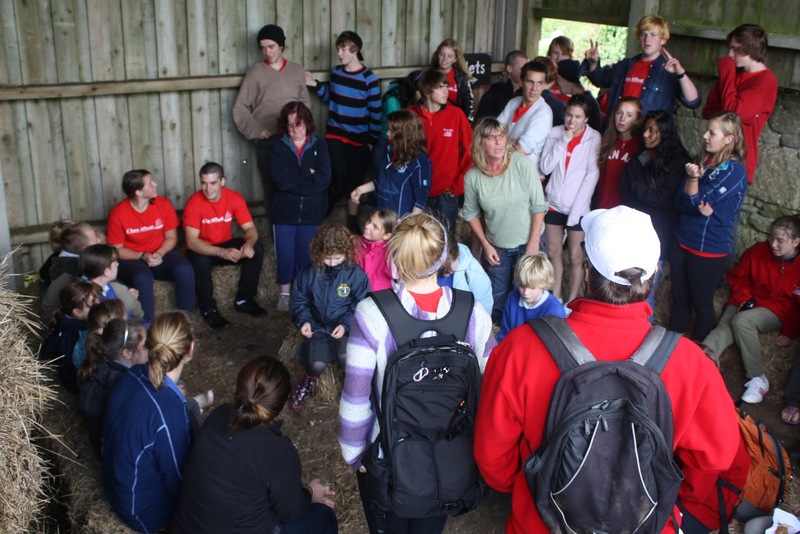 We invited our regular visitors St Just Primary School down for the afternoon too, to meet our international visitors, and so there were 50 mostly Canadian students plus 15 local students to show around the farm. 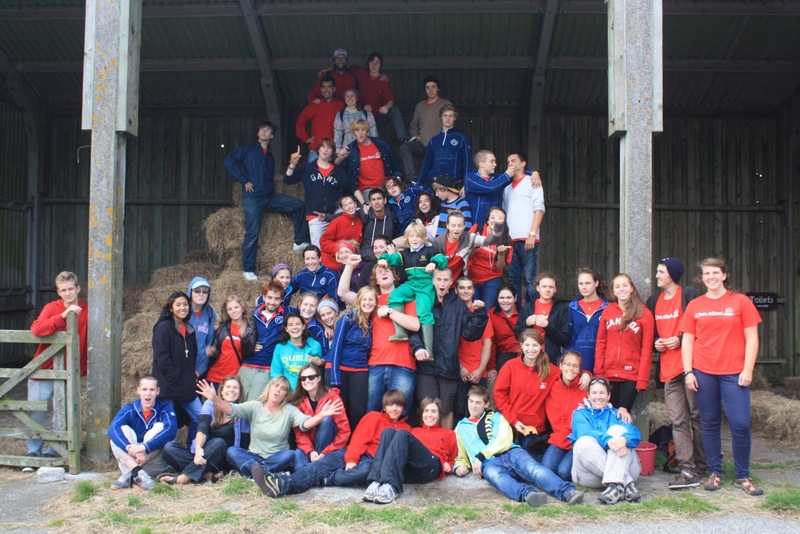 St Just and international students meeting up in the open barn. And over in the chicken field. First we provided lunch (special thanks to Deb for organising this) for everybody, cooked mostly from fresh organic vegetables off the farm itself, then there was a tour of the farm, taking in the turkeys, pigs, chickens, and vegetable field. Greg came along and gave a talk about willow and coppicing, and the southwesterly wind put on its usual display to make his talk even more relevant. 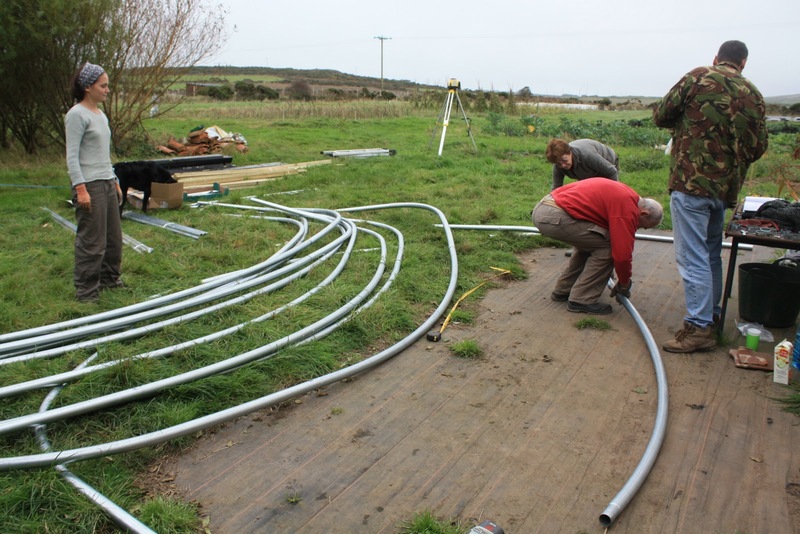 Everybody was very enthusiastic about what we are doing here, which is always a boost for everybody involved with the farm project, and makes all the hard work even more worthwhile. Greg presenting the willow coppice work done on the farm. 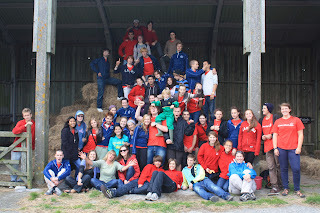 The Class Afloat and Bosavern Community Farm teams in the open barn. Falmouth has been beautiful! The narrow, winding city streets are lined with welcoming shops and places to sample cream tea and Cornish pastries. On Tuesday we had a great day learning about community-led initiatives to increase the resiliency and self-sustainability of local townships. Our day began with a talk by Transition Penwith (to learn more about the Transition Town Network go to: http://www.transitionnetwork.org/), during which we learned about the small ways we can all pitch in to decrease our oil dependency and move towards a greener tomorrow. In the afternoon we enjoyed a scrumptious, organic lunch at Bosavern Farm, a community-run farm that works closely with St. Just primary school. The students gave us a tour of the farm grounds and we learned about the ways in which the school ties the farm into their lessons. Wednesday was a gloriously sunny day and we enjoyed some friendly competition with the crew of the Fryderyk Chopin, a Polish sail-training vessel for high school students, which was docked alongside us at County Wharf. After some exciting rowing races all of the students had some time to mingle at an evening social on the decks of Fryderyk Chopin! Thursday was another wonderful day - we visited Mount's Bay Academy in the morning and Land's End in the afternoon! At Mount's Bay we went on a tour of the school and ate lunch with the Grade 11 students. We then explored the beach at Sennen Cove and ended our day with a trip to the southernmost point of England. We will all be sad to leave Falmouth this afternoon, but Brest awaits! What's selling at the gate these days. After a few days away, Katie came back to wwoof for two more weeks, leaving again last Friday. 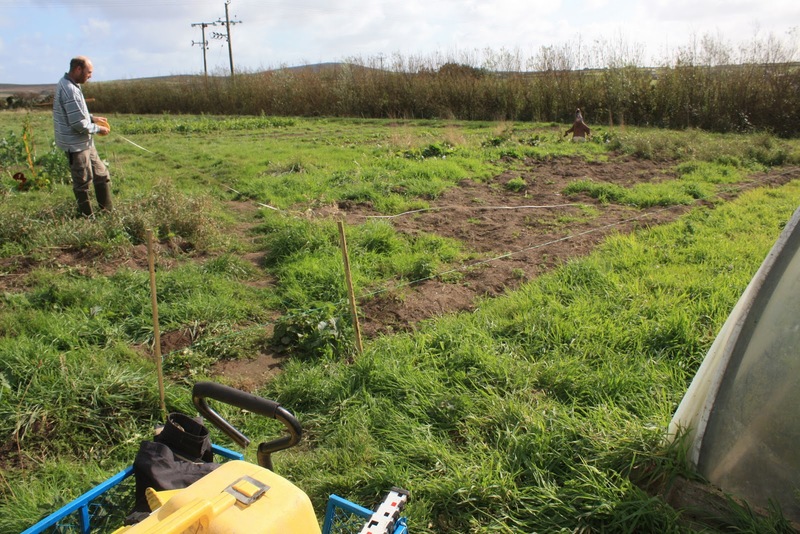 Thanks again to Katie for her hard work on the farm, and for looking after the ranch while Hugh went to the Soil Association symposium in Bristol (more about this later). Katie is continuing her travels now, and we wish her all the best.